Xbox One S 1TB, Forza Horizon 3, Sea of Thieves, Minecraft, Vertical Stand, and extra Wireless controller only £199! This is one of the best Xbox One S bundle deals we've ever seen. Thanks Amazon Prime Day! This is, without doubt, one of the absolute best deals we've seen so far on Amazon Prime Day 2018. That's because for a limited time you can pick up an Xbox One S 1TB along with a vertical console stand, an extra Minecraft Creeper Wireless controller, as well as copies of Forza Horizon 3, Sea of Thieves, and Minecraft for only £199.99. That's a quite ridiculous discount of £190 over its pre-Prime Day price of £389.99, which is a monstrous -49% reduction overall. Now this is an absolutely stonking deal! 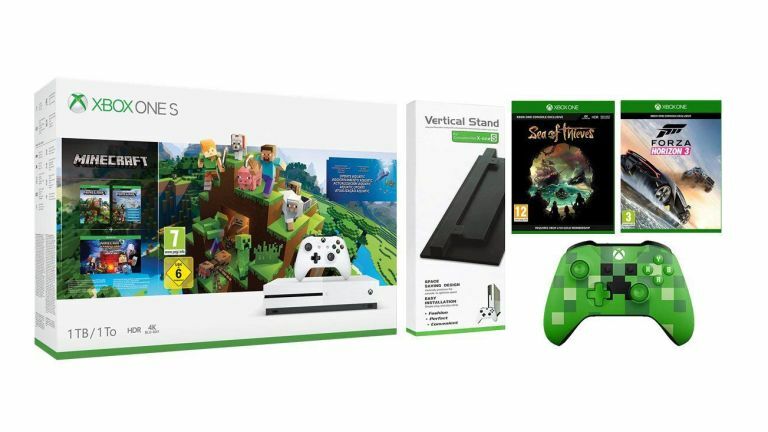 For just £199.99 you can land this super sweet Xbox One S 1TB console bundle, which includes the system itself as well as a vertical console stand, extra wireless controller, and a copy of Minecraft, Sea of Thieves and Forza Horizon 3. That's three quality games on top of a excellent HDR-capable games machine equipped with a 4K Blu-ray drive, as well as a brace of handy accessories for £190 less than pre-Prime Day. We've got to reiterate just how good we think this bundle deal is here at T3.com. We loved the Xbox One S on review, praising its "ability to act not just as a slick gaming console but also a simple-to-use, 4K Ultra HD Blu-ray player and streamer." And, considering that you get the fabulously well reviewed open-world racer Forza Horizon 3, jolly multiplayer pirate simulator Sea of Thieves, and classic virtual build-'em-up Minecraft, as well as some top accessories, too, all for a price that rings in at £50 less than a PS4 normally on its own, makes this a no-brainer. We would advise you to make a move quick, though, as from our considerable experience of Prime Days past, super discounted deals like this one don't last long.